“I love pelagic birding but it doesn’t like me”. I wish I had a tee-shirt with this slogan. I would wear it with pride when birding from docks, piers, and rocky promontories. Other birders leaving the shore behind in pursuit of petrels, shearwaters, storm-petrels, and other drab yet very exciting birds would see the shirt and immediately understand why I stayed back on solid, dry ground to happily (if fruitlessly) scan the open ocean. As they chugged their way out beyond the drift lines and the wave action carried out its unrelenting, uncompromising barrage upon their land-tuned senses, those who unwittingly added their own, personal brand of chum to the vast ocean might wonder if they should have joined me in surrendering all opportunities at getting very cool, tube-nosed lifers. As those poor, suffering birders left last night’s dinner and this morning’s breakfast on the surface of the water, a mental image of me and my shirt would appear and what was previously cast off as fodder for the brain would suddenly take on profound, personal importance. Those rare few who are contemplative in times of duress might feel an odd “Eureka!” sensation upon realization that the seabirds who were partaking of their stomachal stew had been fed as a nestling in a very similar manner. The idea that they were bonding with and becoming momentary foster parents for Wedge-tailed Shearwaters would at the least spark an inner smile and perhaps such birders would feel more justified for sacrificing their stomach to the waves. Most birders, however, have no such Zen-like thoughts as they hang over the railing or urgently, silently fight to calm their inner ears. No, they simply begin to wonder, “Was this trip worth it”? As you may have surmised, I have problems with sea sickness. Although I liked roller coasters in my younger years, I have never been extremely thrilled about the Tilt-a Whirl, Spinning Teacups, Pirate Ship, or other amusement park rides. I think if I rode one of those now, after all of the spinning, vertigo, and brain-scrambling madness had come to a stop, if I were even capable of lifting the safety bar, I would probably be about as coherent as melted butter. It was with extreme and sophomoric bravery then that I ventured out onto the open ocean for my first Costa Rican pelagic birding trip this past Sunday, November 14th. I was coaxed into accepting an invitation to bird the offshore waters of the Costa Rican Pacific Coast by the certainty of multiple lifers, new birds for my Costa Rican list and the year, and that on past pelagic trips with the same boat, the seas had never been “rough”. I had such trepidations about doing a pelagic trip here or anywhere else due to the strong impressions left by my first and only pelagic birding experience off the coast of Oregon in 1996. What a memorable trip that was! Hundreds of phalaropes, flocks of Sabines Gulls, Pink-footed Shearwaters, Fork-tailed Storm-Petrels, all three jaegers, dozens of Black-footed Albatross and two Laysan Albatross! The birds were fantastic but the way in which I saw them should have been included as a footnote in Dante’s “Inferno”. Despite having taken Dramamine, I greeted nearly every bird species that approached the boat with unbridled vomit. You would have thought that they would have flown back up to the Bering Strait after such a horrible reception but fortunately, seabirds are such hardy, salty souls that they didn’t even blink an eye. 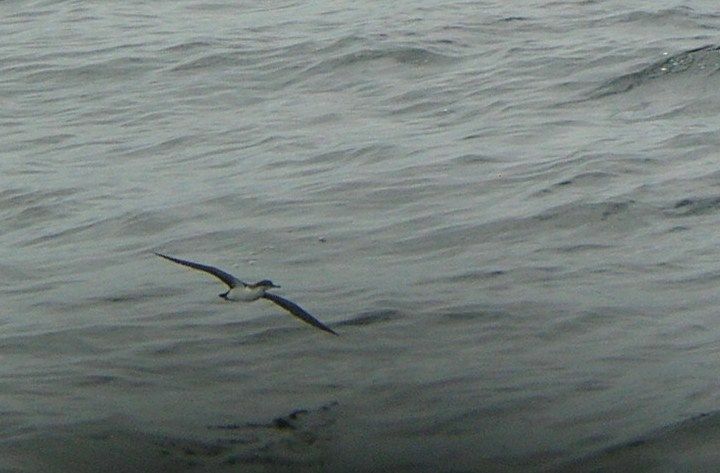 For example, my lifer Laysan Albatross flew so close to the boat that I nearly stained its immaculate white plumage. Despite unwittingly chumming the water mere inches from this majestic bird, it just drifted on past on massive wings, completely unfazed. I got a bunch of lifers and the experience was incredible but I assure you, I paid such a strong price for it that I had pretty much written off seeing all pelagic species anywhere unless they were blown to shore or inland by massive hurricanes. Last week, though, local birder and friend Paul Murgatroyd sent me an invitation to join him and six other stalwart birders for a day trip out onto the Pacific in search of avian treasure. While I was pondering whether or not I should accept this gracious invitation, Paul called and with tales of smooth waters, hardly anyone feeling ill over the course of six trips, and the chance at several lifers, how could I say no? Doing the trip without getting sick actually sounded feasible and was guaranteed to be an incredible experience. I would bring something other than Dramamine to fool the inner ear, nibble on salty snacks, watch the horizon, and see some new birds! Early Sunday morning, eight of us departed the Los Sueños Marina on “The Floating Bear”, a fifty foot Beneteau sailboat that had brought Paul and other birders to Costa Rica’s first Tahiti Petrel, Christmas Island Shearwater, and other birds you just can’t see from the mainland. 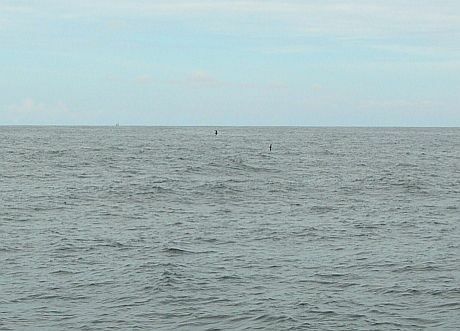 We knew we would have to be very lucky to get these and other deep water species because we wouldn’t be heading past the continental shelf but in such uncharted waters for birding, you almost can’t even guess at what might or might not show up! Chugging straight out to sea, our first memorable sighting was of a mother Humpbacked Whale with her baby! They were kind of far away but still impressive enough to elicit excited exclamations from all on board as we watched mother then baby leaping out of the water to breach off of Playa Herradura. A few Magnificent Frigatebirds and Laughing Gulls could be seen but for the most part, inshore, the sea was devoid of bird life. After a short detour, our trusty skipper “Greivin” pointed the bow towards Tahiti and we slowly but surely made our way into the realm of tube-nosed birds. As we left the shore behind, the water became ruled by an endless series of waves and thus began the battle with my inner ear for supremacy of my stomach. The fiercest fighting took place during the first two or so hours of the trip because this is when the inner ear makes its most vehement protest and attempts to coerce the gut into becoming its ally. I would never have won the fight on my own but that’s why I enlisted help in the form of a Dramamine like medication by the name of, “Gravor” (oddly enough sounding much like the name of the skipper) as well as an ample supply of salty plantain chips and crackers, and the determination to watch the horizon for hours on end. That little pill sometimes made it tough to think and would be a serious hindrance to giving an eloquent speech but it definitely helped me keep control of the stomach and calm down the inner ear when looking for pelagics off the Costa Rican coast this past Sunday. Nibbling crackers, sipping water, and watching the horizon also played their part but I think it was the Gravor that did the job. Brown Boobies flapping past the boat and looking smart in perfect light, we had these for much of the day and saw flocks winging their back to the islands they use for roosting after foraging on the open ocean. Small groups Sabines Gulls (!) with crisp contrasting markings on their wings, I hadn’t seen this beautiful gull for many years. A few flocks of Red-necked Phalaropes riding the waves like gray and brown bathtub toys, most of their kind had probably already passed through the area. Wedge-tailed Shearwaters coming in three different phases, we saw dozens of this life bird throughout the day. 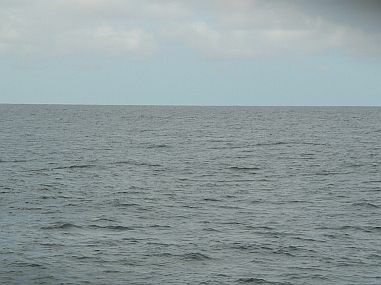 The two dark specs are Wedge-tailed Shearwaters. A single Pink-footed Shearwater was a good record for the area. 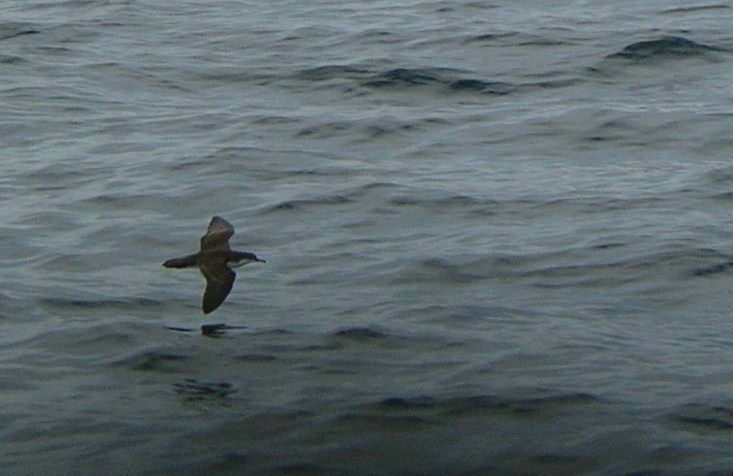 A few Audubons’ Shearwaters were seen. This lifer was my favorite bird of the trip because two individuals flew too close to the boat for binoculars. I snapped away with a hand-held camera and look what happened! Black Storm-Petrels zipping low over the waves like shadowy nighthawks, this life bird was the most common storm-petrel. Wedge-rumped Storm-Petrel was another much wanted life bird for me. We had very few white-rumped storm-petrels on Sunday. I got a good look at the first group of birds and saw features for Wedge-rumped but may have missed a Band-rumped (gasp!) because Kevin Easley mentioned seeing a bird that may have been this species. In the second group of white-rumped storm petrels, I have a mental snapshot of one bird that lacked the white wedge of the Wedge-rumpeds as well as white on the undertail. I suspect it was a Leaches or Band-rumped and hope that photos taken by Kevin or Juan Diego will reveal its identity. 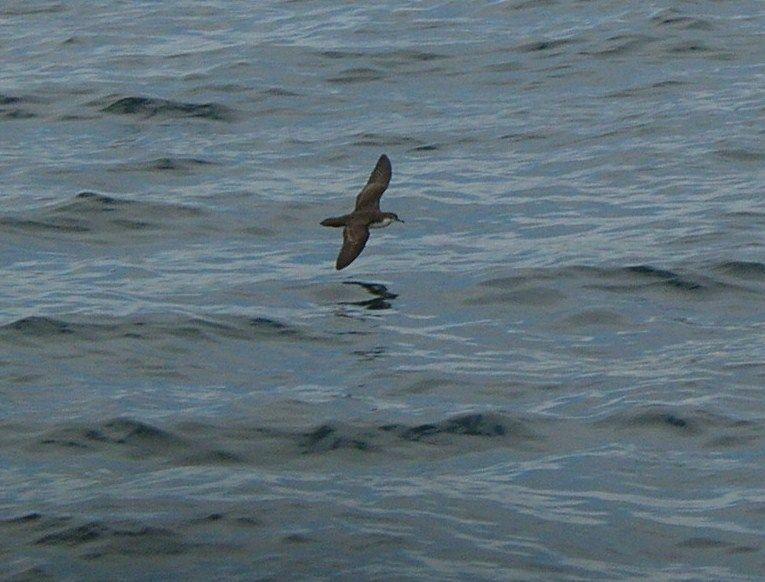 We had surprisingly few Least Storm-Petrels. The only storm-petrel I had seen in Costa Rica before this trip, they were pretty easy to recognize by their bat-like flight. Several Pomarine Jaegers, adults and juveniles. How can one not be enthralled by a chunky, falcon-like seabird? Two big juveniles following a fishing boat were masquerading as skuas. Parasitic Jaeger– at least one dark phase adult flew low over the water and was one of our first birds of the day. We had scattered sightings of Black Terns until a flock of a 100 or so flew past around 4 pm. At least one Common Tern was a year bird for me. On the non-avian front, we had twenty or so Olive Ridley Sea Turtles, one billfish species that may have been a Swordfish, a few Manta Rays jumping clear out of the water, and two species of dolphins, Striped and Spotted. These were a highlight of the trip as they purposely swam close to the boat and proceeded to porpoise alongside us. 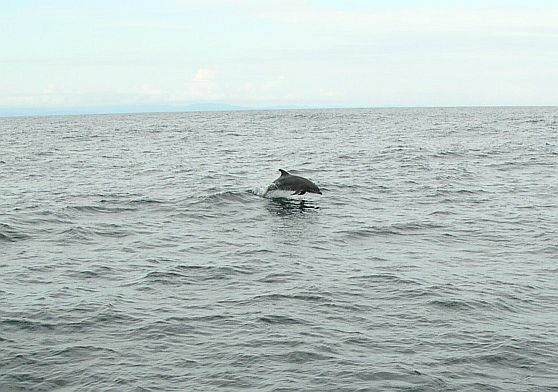 One of the Striped Dolphins. 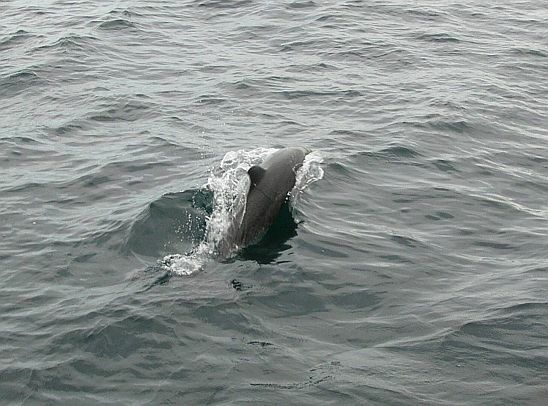 One of the Spotted Dolphins. Our trip back towards shore was more easy-going than the way out because we rode swell after shore-going swell the whole time. Night fell at least an hour before we pulled into the marina. As everyone else descended below decks, I opted for staying up top to feel the wind and watch the dark waters go by. It was an experience made limbo-like by the sounds of constant wind and waves and onshore lights that never appeared to get any closer. As we approached shore, I could smell land- a mixture of smoke, earth, and dank, tropical vegetation. The dark forms of two Magnificent Frigatebirds hovering above the mast of the Floating Bear also reminded us that we were no longer coursing over the open sea. We had made it back from the watery pelagic lands after the briefest of jaunts into uncharted birding territory and I had done so without getting sick! I’m not sure when I will find myself in the company of pelagic birds again but until then, I will always be wondering just what else is out there beyond the horizon. Congratulations, Patrick, on getting tough when the birding gets challenging! Liz and I have only done one pelagic, off the coast of Washington, but we enjoyed it tremendously. 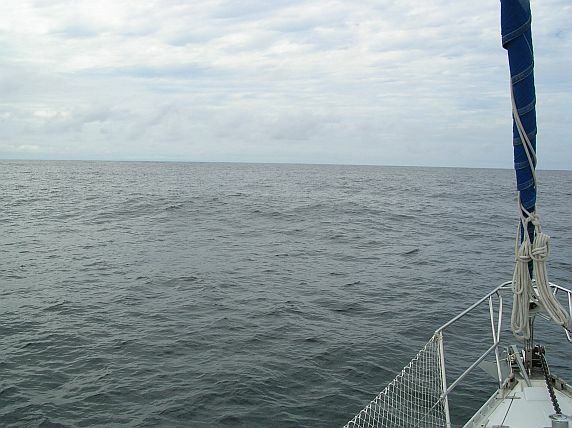 Lucky for us, no sea sickness problems, despite the fairly rough waters. Unique way to bird, to say the least. How’s the year list look now? The pelagic I did up north left out of the Oregon/Washington border area. I wonder if we birded the same waters? Year list is coming along nicely- up to 560. If I make an effort to get shorebirds and missing species, I might actually break 600! One word – Scopolamine. My first pelagic was out of Westport, Washington, and I got pretty sick. Didn’t miss any birds because of it, so I didn’t complain too much. For the couple I’ve done since I’ve worn the patch, and haven’t gotten close to sick. But it’s efficacy varies person to person from what I understand. Glad you were able to make it through unscathed! Liz and I did the Westport trip, like Grant. Captain said the roughness factor was a 5 out of a possible 10. Several people fell to the deck at times. Too bad that I chose to put our camera away rather than take a chance with getting it banged up or wet. You’ve already seen more species in one year than I have in 10 in the States. Where are the best places for shorebirds in CR? @Grant-That is actually also where I did my first pelagic. I couldnt find the patch in CR but am glad I survived the trip anyways! @Steve- Best spots for shorebirds in Costa Rica are at a few sites on the Pacific somewhat near Puntarenas. Shrimp ponds at Chomes are especially good. A few sites near Tarcoles can also be productive. Terrific trip, Pat. I love the combination of avian and cetacean sightings. @Mike-To be honest, for me, the cetaceans were just as exciting as the birds. @Mike-thanks, yes, it was pretty exciting! For a landlubber like myself, the dolphins swimming near the boat were particularly incredible.